Photoshop does not recognize my video card. Modeled on the 2gb card below. I need help because my Photoshop updated to version 2014, and he is closing in error for these problems happen. 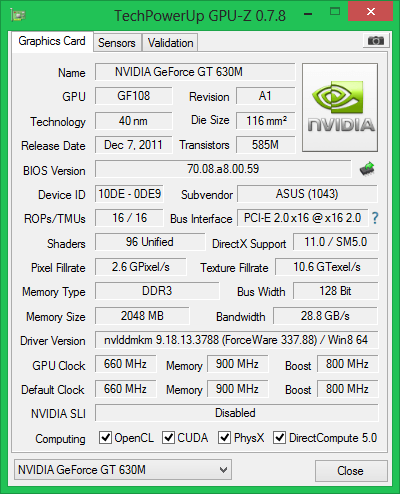 Check Help -> System Info for what Photoshop can see of your GPUs. Most likely you need to update your video card drivers from the GPU maker's website. Hello, I've done it, and it always happens with systems from Adobe, Illustrator both CC 2014 CC 2014 as Photoshop. If you have some other step by step, please inform, because as you saw in the picture of GPU-Z he can receive the information from the video card, as happens with Adobe instead. If you have some step by step help me please. We can't offer step by step instructions because we have no idea what is wrong with your video card. You have to tell us, or at least copy the system info log here so we can see, what is going wrong with your video card. Again, most problems with video cards are solved by updating the driver software from the GPU maker's website.